petition: Don't let China host the 2019 World Dog Show unless it stops Yulin's dog-meat festivals! 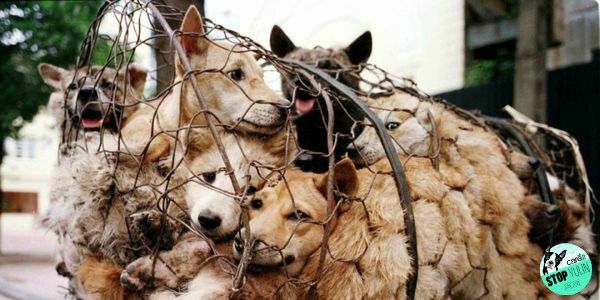 Don't let China host the 2019 World Dog Show unless it stops Yulin's dog-meat festivals! The Fédération Cynologique Internationale (FCI), the major federation of kennel clubs, hosts the World Dog Show every year. 10,000 dogs enter the competition, which has been called the "world's most important dog show." Until recently, 10,000 was also the number of dogs eaten each year at the Yulin dog-meat eating festival in China - where FCI is planning to host the 2019 World Dog Show. There will be 1,000 dogs tortured, killed, and eaten at this year's 10-day festival, which is still horrific. As long as the government of China has not stopped the Yulin Dog Meat Eating Festival, it is not acceptable that the largest worldwide dog organization will support and arrange its biggest annual dog competition in such a country. Other petition targets are the Chinese authorities. With this petition, we want to send your opinion to the government and the dog organization FCI. We will not support and participate in the WDS2019 as long as China accepts the Yulin Dog Meat Eating Festival, and therefore we ask FCI to move the WDS2019 to another country with a more humane view on animal welfare until China stop this horrible tradition. Please sign today!